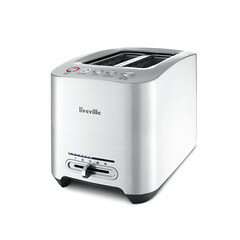 The Breville Die-Cast 2-Slice Smart Toaster™ — A toaster that offers a bit more. The Die-Cast 2-Slice Smart Toaster takes functionality to new heights. C. Led Toasting Progress Indicator. D. Variable Browning Control Slide. E. Slide-Out Crumb Tray. F. Cord Storage. G. Auto 'LIFT & LOOK'™ Button. H. Intelligent Auto-Lowering 1.5" (W) x 5.5" (H) Slots with Self Centering Carriage. I. 'DEFROST' Button. J. 'BAGEL' Button. K. 'A Bit More'™ Button. 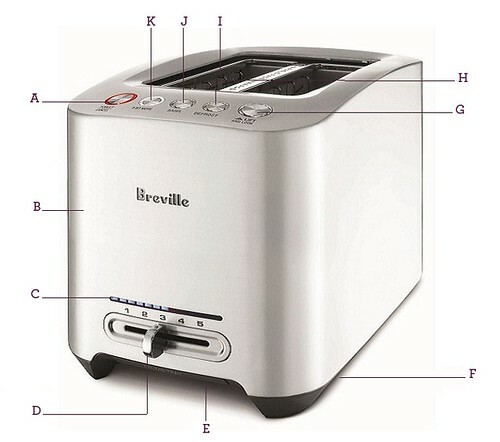 Not Shown Breville Assist™ Plug.